Fireplaces come in various sizes and shapes and Pleasant Hearth Fireplace Doors have you covered! They offer 3 different sizes across the fireplace door range, which cover the majority of fireplaces in your homes. 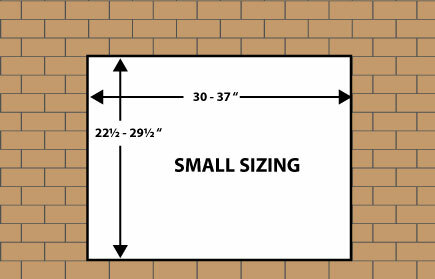 We made this guide to makes it easier for you to choose the correct size for your fireplace. Make sure you measure the inside width of the fireplace opening. A good idea to check the top and bottom width of the fireplace as you might find that the top is wider than the bottom or visa-versa. If there is a difference in size take the larger measurement. Measure the height of the fireplace opening. So this would be from the bottom to the top of the fireplace opening. Like the widthh measurement, it’s a good idea to measure both sides of the fireplace in case there’s a slight difference in measurement. Always double check the measurements you’ve written down! It’s never fun when you get your fireplace door delivered, only to find it doesn’t fit. Suitable Width 30" ~ 37"
Suitable Height 22 ½" ~ 29 ½"
The smallest of the Pleasant Hearth fireplace door range, suitable the smaller sized fireplaces. 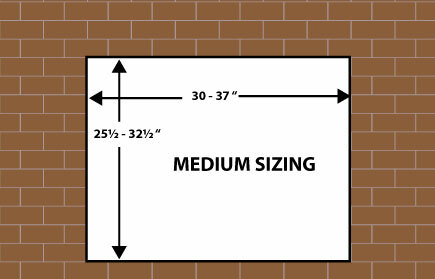 Suitable Height 25½" ~ 32½"
These medium sized fireplace doors come in the same width as the small size, but with the higher frame size it’s suitable for those fireplaces that are that little bit higher, in the range of 25½~ 32½”. Suitable Width 36" ~ 43"
Suitable Height 25 ½" ~ 32½"
The largest fireplace door range from Pleasant Hearth, this accommodates the generously sized fireplaces ranging from 36″ to a sizable 43″ wide fireplace and 25½ to 32½” high fireplaces. Here’s a comparison table for the different sizes. You can sort the columns by clicking on the column titles. Still unsure if your fireplace opening is compatible?